TSPSC TRT 2017 Instructions to Teachers Recruitment Test Candidates. 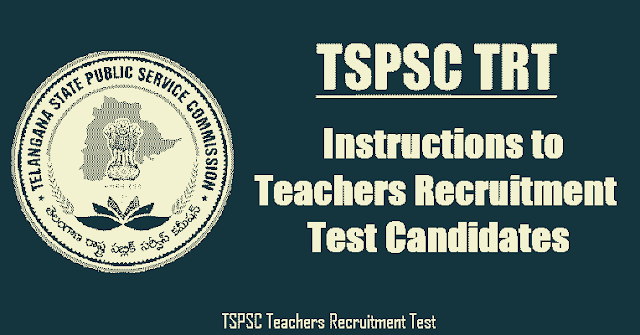 TSPSC has given instructions on TSPSC TRT Recruitment, TRT Exam dates, TRT Certificates verification, TRT Results, Upload TRT Online application form. Edit Option to the Candidates (For 3 days) for Biodata Corrections. TSPSC given Instructions regarding Offline OMR Based TRT Examination for Candidates and also given Instructions Regarding Online Examination for Candidates. Telangana government notified 8,792 teacher recruitments. The long awaited notifications for Teacher Recruitment Test to fill 8,792 vacancies in government schools were released by TS Public Service Commission. Of these, 964 vacancies are for English medium teachers. Over 4 lakh candidates are expected to compete for these posts. This the first teachers recruitment drive being taken up in the state after bifurcation. The five notifications were issued for 1,941 school assistants , 416 physical education teachers (PET), nine assistants to PET, 1,011 language pandits and 5,415 Secondary Grade Teachers (SGTs). Applications will be accepted from October 30 to November 30. The TSPSC said the dates of written examination will be announced in the second week of February 2018. A 20 per cent weightage for score in Teacher Eligibility Test will be provided in recruitment exams for school assistants, SGTs and language pandits. The local status of candidates will be determined as per Presidential Order. The posts will be filled by taking the district as a unit, the commission said. 2) The candidates must note that his/her admission to the examination is strictly provisional. The mere fact that an Admission to the examination does not imply that his/her candidature has been finally cleared by the Commission or that the entries made by the candidate in his/her application have been accepted by the Commission as true and correct. The candidates have to be found suitable after verification of original certificates; and other eligibility criteria. The Applicants have to upload his/her scanned recent colour passport photo and signature to the Application Form. Failure to produce the same photograph, if required, at the time of interview/ verification, may lead to disqualification. Hence the candidates are advised not to change their appearance till the recruitment process is complete. 3) The candidates are not allowed to bring any Electronic devices such as mobile / cellphones, Calculators, tablets, iPad, Bluetooth, pagers, watches to examination centre. Loaning and interchanging of articles among the candidates is not permitted in the examination hall and any form of malpractice will not be permitted in the exam hall. 4) The candidates are expected to behave in orderly and disciplined manner while writing the examination. If any candidate takes away Answer Sheet of OMR based examination, the candidature will be rejected and in case of impersonation/ disorder/ rowdy behaviour during Examination, necessary F.I.R. for this incident will be lodged with concerned Police Station, apart from disqualifying his / her candidature. 5) Candidates trying to use unfair means shall be disqualified from the selection. No correspondence whatsoever will be entertained from the candidates. at any stage of the Examination. Candidates are directed to take note that, after last date of receipt of Applications, Edit option to the candidates will be allowed for three (3) days to make any corrections regarding their Biodata particulars/Data corrections/Omissions etc., in the Online application already submitted to the Commission. After the due date, Data corrections through Online/Paper representations/Corrections on the Nominal Rolls will not be accepted under any circumstances. 1) The candidates have to report 30 minutes before to the examination venue to record their thumb impression on Biometric system. - Name of the Examination Centre etc., in the Answer Sheet, which will be provided to him/her in the examination hall. Original Copy (Top Sheet) and Duplicate Copy (Bottom Sheet). The candidate is required to use Ball Point Pen (Blue or Black) for filling the relevant blocks in the OMR Sheet including bubbling the answers. After writing the examination the candidate has to handover the original OMR sheet (Top Sheet) to the invigilator in the examination hall, if any candidate takes away the original OMR Sheet (Top Sheet) his/her candidature will be rejected. However the candidate is permitted to take away the duplicate (Bottom Sheet) OMR Sheet for his/her record. The candidates should bring Ball Point Pen (Blue/Black and smooth writing pad) to fill up relevant columns on the Answer Sheet. The candidate must ensure encoding the Register Number, Subject/Subject Code, Booklet Series, Name of the Examination Centre, Signature of the Candidate and Invigilator, etc., on the O.M.R. Answer sheet correctly, failing which the Answer sheet will be rejected and will not be valued. Use of whitener on OMR Sheet will lead to disqualification. 4) The OMR Sheet is to bubble only by Ball Point Pen (Blue/Black). Bubbling by Pencil / Ink Pen / Gel Pen is not permitted in this examination. 5) The candidates should satisfy the Invigilator of his identity with reference to the signature and photographs available on the Nominal Rolls and TRT Hall Ticket. 6) No candidate should leave the examination hall till expiry of fulltime. 7) The Commission would be analyzing the responses of a candidate with other appeared candidates to detect patterns of similarity. If it is suspected that the responses have been shared and the scores obtained are not genuine/ valid, the Commission reserves the right to cancel his/ her candidature and to invalidate the Answer Sheet. 8) (i)Wherever Written Examination is held, only those candidates who are totally blind are allowed to write the examination with the help of scribe and 10 minutes extra time is permitted to them per hour. extent slowing the performance of function (Minimum of 40% impairment). No scribe is allowed to such candidates. Orthopedically Handicapped. However, no extra time will be granted to them. (a) The scribe should be from an academic discipline other than that of the candidate and the academic qualification of the scribe should be one grade lower than the stipulated eligibility criteria. 1) Candidates shall report at the venue one and half hour (90 minutes) before the Commencement of Examination as the candidates have to undergo certain procedural formalities required for online examination. 3) The examination link with the login screen will already be available on your system. Please inform the invigilator if this is not the case. 4) 10 minutes prior to the exam, you’ll be prompted to login. Please type the Login ID (Roll No) and the Password (Password for Candidate will be given on exam day) to proceed further. 5) Invigilator will announce the password at 09.50 AM and 02.20 PM. 6) Copying or noting down questions and/or options is not allowed. Severe action will be taken if any candidate is found noting down the questions and/or options. Profile Information - Check the details & click on “I Confirm” or “I Deny”. Detailed exam instructions - Please read and understand thoroughly. Please click on the “I am ready to Begin” button, after reading the instructions. 8) You have to use the mouse to answer the multiple choice type questions with FOUR alternative answers. 9) To answer any numerical answer type question, you need to use the virtual numeric key pad and the mouse. 10) On the online exam question screen, the timer will display the balance time remaining for the completion of exam. White (Square) - For un-attempted questions. Red (Inverted Pentagon) - For unanswered questions. Green (Pentagon) - For attempted questions. Violet (Circle) - Question marked by candidate for review, to be answered later. Violet (Circle with a Tick mark) - Question answered and marked by candidate for review. 12) After answering a question, click the SAVE & NEXT button to save your response and move onto the next question. 14) To clear any answer chosen for a particular question, please click on the CLEAR RESPONSE button. is available for each section. You have to place the cursor over the section name for this summary. Invigilator's confirmation, click on the font size you wish to select. The font size will be visible on the top. 17) You may view INSTRUCTIONS at any point of time during exam, by clicking on the INSTRUCTIONS button on your screen. 50 Minutes for PWD candidate eligible for compensatory time. Please keep checking the timer on your screen. 19) In case of automatic or manual log out, all your attempted responses will be saved. Also, the exam will start from the time where it had stopped. tearing ONLY the password from it. 22) Please inform the invigilator in case of any technical issues. 23) Please do not talk to or disturb other candidates. 24) In case you are carrying articles other than the admit card, photo identity proof and pen, please leave them outside the exam room. 25) You cannot leave exam room before submitting the paper. Please inform the invigilator if you want to use the wash room.